Growing up spending my Summers in Thailand as a young one, one of my favorite things to do was accompany my mother to different temples (aka Wats). My grandparents lived down the street from one and I remember waking up to monks chanting in deep tones over an intercom, putting me in a hypnotic trance. There were also times when I’d run downstairs for breakfast to see monks adorned in their orange robes, standing in a line out in front of the house as they were served food from my family as merit offerings. It was here I absorbed all things Thai Buddhist--an experience that exuded the energy of complete calmness. On my most recent trip I discovered new temples, ones that far exceeded my expectations. This is my list of the most notable. Chao Sai Namphung requesting the emperor of China’s daughter to be his wife. soul, and he named the temple “Wat Phanan Choeng". 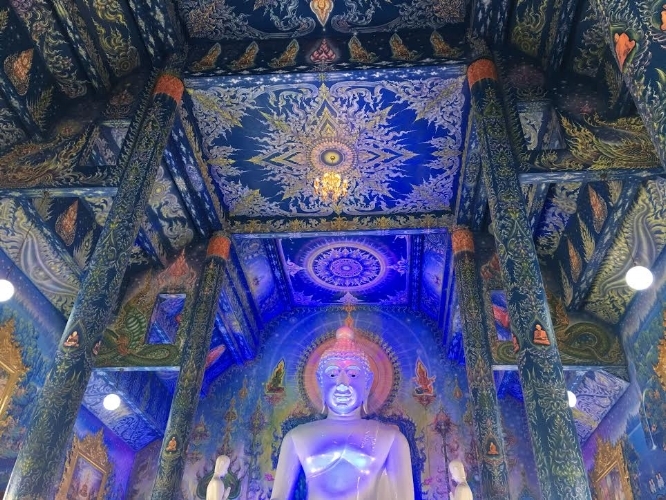 This temple is located south of the city center in a district called Phai Ling. The grounds are stunning, as you make your way through the old ruins. It felt a bit like a maze, where one area unfolded to another, creating an effortless cohesion of history and art. The Lying Buddha is right near the entrance and is a great sight to see as you start your way through. Back in the day, the place was filled with moats, as influence from the Khmer era before. One can only imagine what this place looked like before the Burmese destroyed it, but at least we have what remains. This temple is one of the most important in Ayutthaya’s history and housed some of the most precious Buddhist relics in the region. It’s much more rustic than the other temples, but it also feels more serene. It has actually collapsed many times, but luckily for the temple, it has been restored each time. One of the biggest attractions is a Buddha head embedded in a neighboring tree of the most notable statues. This temple is not nearly as old as the others, but it is one of the most visually stunning. It looks like something of a fantasy movie set. Everything is white and silver, which is relatively uncommon, and made with such detail that it is easy to overlook some parts. 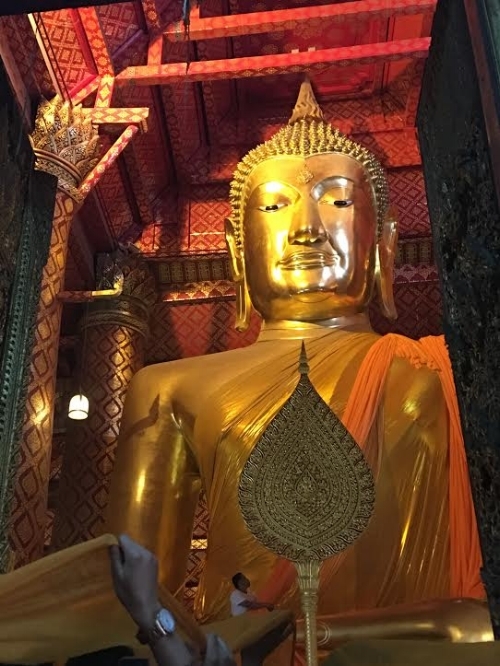 The original Wat was in dire need of some repairs, so a Thai celebrity took it upon himself to head the renovation to his liking. The result was this over-the-top temple. At times it feels a bit gimmicky, but then when you step back, you realize that there’s so much appreciation that comes from the sheer elaborance of architecture, which is a combination of old and new school. Even though it may seem like a Buddhist temple, it is in fact, an art museum created by the esteemed artist Thawan Duchanee, but I’m going to include it anyways because I think it is important to share. There are 15 houses on the property and the artist actually lived there up until his death. It is very controversial, especially in regards to the taxidermy house which is adorned with skins of exotic animals ranging from crocodiles, water buffalo, snakes, etc. To me, it does speak of a direct correlation between Thailand’s esteemed spirituality and seedy underground culture of exploitation. From the distance, the temples seem unassuming, but it couldn’t be further from the truth. The Guan Yin statue is of epic proportions and the pagoda style temple on its right is just as intriguing. Guan Yin is adorned in white and silver, much like the previously mentioned White Temple, and the story behind the birth of the temple is that it came to one of the esteemed monks in a dream and upon waking up, he knew exactly how to build it based on the visions instructions. I’d suggest paying a little bit of money to take the elevator to the top of her head. Next door the other temple is circular in architecture and has more traditional details in its adornment. When you go inside, there’s the main Buddha statue which will greet you, but I encourage anyone to continue up the stairs to see where it takes you. 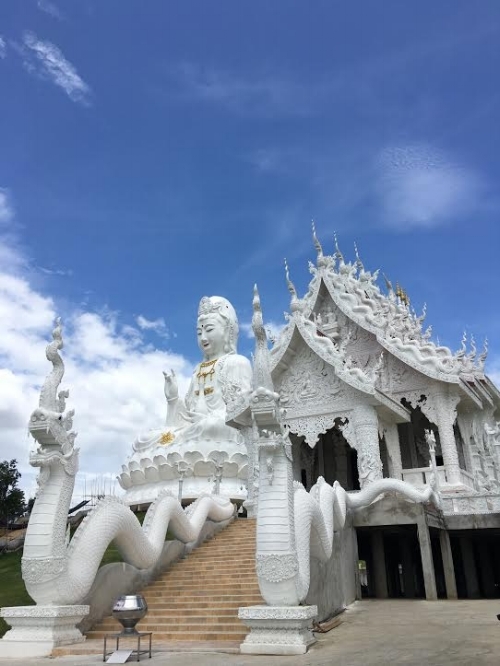 Each floor has a handful of deities representing different facets of Thai Buddhism, and the further up you go, the smaller and smaller the spaces become, until you reach the top, which has 180 degree views of the surrounding Chiang Rai area. This Wat was the most peaceful one of all. It felt as if you stepped into a watery haven--one could sit there for hours in joyful bliss. The quiet music playing in the background sounded like ocean recordings and the walls were adorned with murals of Buddhist princes and spirits languidly enjoying their otherworldly environment. It was the perfect fairy tale setting to end our Wat tour.